The Stewart + Minor project (website), located on the edge of downtown in the Denny Triangle district, is anticipated to be one of Seattle’s most unique, sleek and customizable loft towers. 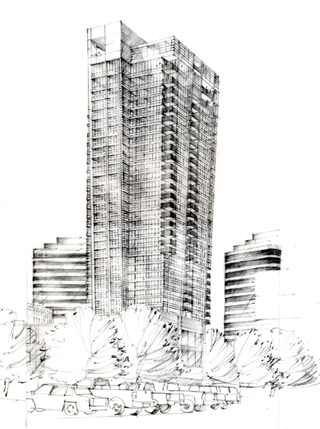 The 440 foot-tower will feature a hotel on the lower 14 levels and 168 loft homes on the upper 14 levels. The concept is based on a 600 sq ft open one-bedroom design with an 18′ ceiling height. Buyers may elect to customize the base units with a 2nd mezzanine/loft-level that’ll reconfigure the unit to a formal one-bedroom plus den and two bathrooms. With the mezzanine/loft level, livable space is increased by nearly 50%. Buyers will also have the option to combine units creating larger living spaces. The mezzanine/loft level can either be included as an upgrade at purchase or added at a future date. The main level layout is fairly similar to the 600 sq ft open one-bedroom units at The Gallery, except the kitchen does not extend as far into the living room area. All homes will come with an unfinished mezzanine level that covers the bath and part of the bedroom. 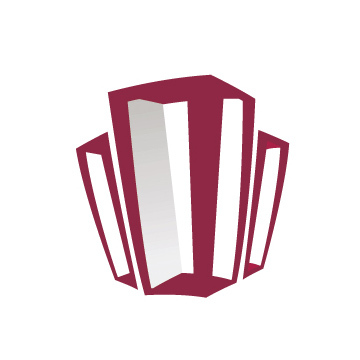 Interiors will feature floor-to-ceiling windows, exposed concrete columns, exposed metal ducts, solid surface floors and stainless steel appliances. 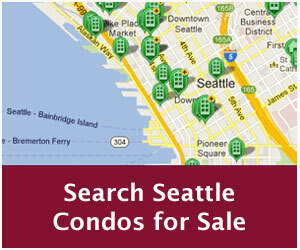 The units are being designed to allow owners considerable interior personalization options. The building will be topped with a rooftop terrace and bar. 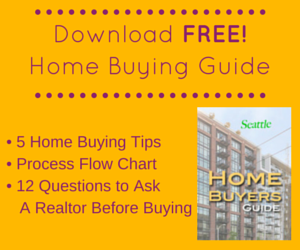 Homes are expected to start from the low-$400,000s to more than $1 million. The project is anticipating first occupancy in 2011 and expects to begin construction in late 2008 or early 2009. A sales presentation center will likely open by next summer. Stewart + Minor is being developed by GIS Intenational and designed by Collins-Woerman. 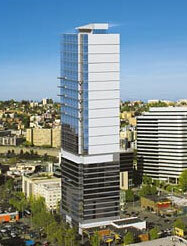 GIS International is currently developing Bellevue’s exclusive European Tower condominium. 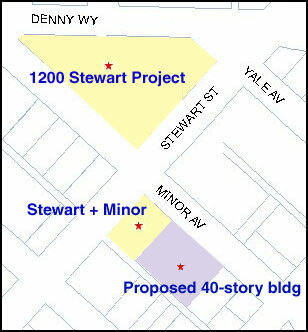 So what’s that 40-Story building behind Stewart + Minor? It’ll be the 440′ Kinects apartment building at 1823 Minor Ave being developed by Security Properties. However, based on preliminary plans, Stewart & Minor units do not face the Kinects building, thus there shouldn’t be any blocked views. Kinects will feature 316 units in a bowed out design that will be wider at the top. On three sides the building, units will have a 6-inch slope in the interior curtain wall from the floor to ceiling. A lap pool is planned for the roof. Construction is expected to start in 2008.